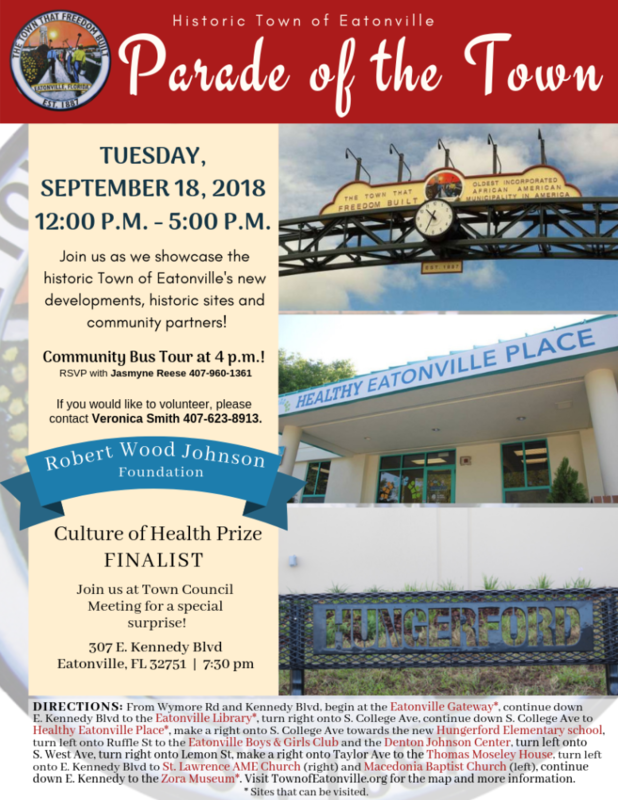 Tuesday, September 18th, 12-5 p.m.
Join us as we showcase the historic Town of Eatonville’s new developments, historic sites and community partners! Tour the town at your own leisure and learn about the historic buildings, engage with community partners and enjoy the experience that is the Zora Museum. Take home information at selected stopping sites! We value the historic charm of our community and welcome you. Tour the 10 sites and be sure to share your photos and check-in on facebook. The Parade of the Town is walkable and bikeable. Join us later at the Town Council Meeting for a special surprise and refreshments! Town Hall 307 E. Kennedy Blvd Eatonville, FL 32751 | 7:30 p.m.